Ayahuasca is a name both for the plant and for a potion composed of yage and other ingredients (often including plants containing DMT). Disagreement exists about whether a particular name is properly applied to the plant, to the potion, or to both. The brew is used as a traditional spiritual medicine in ceremonies among the Indigenous peoples of the Amazon basin. 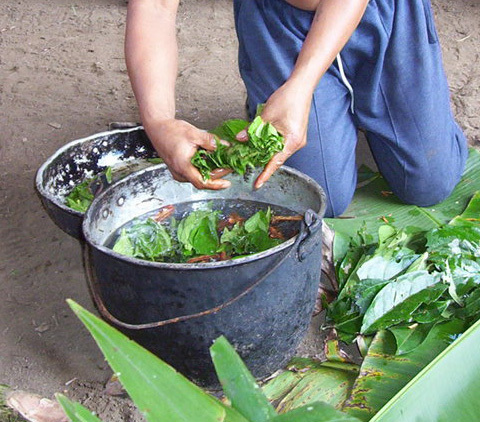 Among native peoples of the Amazon, the ayahuasca potion is used in contexts of healing and religion. Healing may be psychological; in some regions yage is called “vine of death,” a name that one authority interprets as referring to liberation from a troubled life and being born again into a better life after using yage. Evidence exists that the ayahuasca potion may have antidepressant actions. In its traditional Amazon setting drinkers of the preparation claim to experience ESP (extrasensory perception) and sensations of ﬂying. What are other names for Ayahuasca? Other names for Ayahuasca that are also used are Caapi, Daime, Huasca, La Purga, Vine, Vine of Death, Vine of the Soul, Visionary Vine. Indigenous peoples of the Amazon and Orinoco River Basins of South America have used tryptamine- containing concoctions such as ayahuasca for spiritual and medicinal purposes since before the time of Christ. Ayahuasca and the vessels for drinking this beverage were sacred in these primitive cultures. An experienced healer (ayahuascero) conducted the ritual use of ayahuasca after many years of training and preparation (e.g., periods of isolation, dietary restrictions, sexual abstinence). These rituals included special songs (icaros) and the use of other plants (e.g., tobacco). Jesuit missionaries recorded the ﬁrst European references to ayahuasca in the early 18th century. During the middle 19th century, English botanist Richard Spruce compiled an inventory of native plant life in the Amazon. Besides discovering the rubber tree (Hevea spp.) and cinchona bark (quinine), he identiﬁed Banisteriopsis caapi as one of the sources of the psychedelic brew, ayahuasca. In the 1920s, banisterine was introduced as a treatment for Parkinson disease. The source of this hallucinogenic compound was Banisteriopsis caapi; subsequent studies demonstrated that the β – carboline, banisterine was identical to the reversible monoamine oxidase inhibitor, harmine. Interest in using this substance as a treatment for Parkinson disease waned in the early 1930s. During the 20th century, the ritual use of ayahuasca extended to modern syncretic religious movements that combined Christian liturgy and African spiritualism, particularly in Brazil. In 1987, the use of ayahuasca in religious ceremonies was legalized in Brazil. The use of ayahuasca containing N , N-dimethyltryptamine by members of the Uniao do Vegetal Church is legal in the United States based on the US Supreme Court interpretation of the 1993 Religious Freedom Restoration Act. Banisteriopsis caapi of the family of Malpighiaceae, is a tropical plant that has smooth, chocolate-brown bark and opposite, oval-shaped green leaves ranging in size 3.5-8cm wide and 8-18cm long. The compound inﬂorescence is axillary or has terminal cymose panicles (i.e., increased, irregular branching in the upper parts with each branch containing a ﬂower). The ﬂowers are about 1cm in diameter with pink petals. The fruit is a samara nut that produces fan-shaped green seeds. Upon ripening, these seeds turn brown. 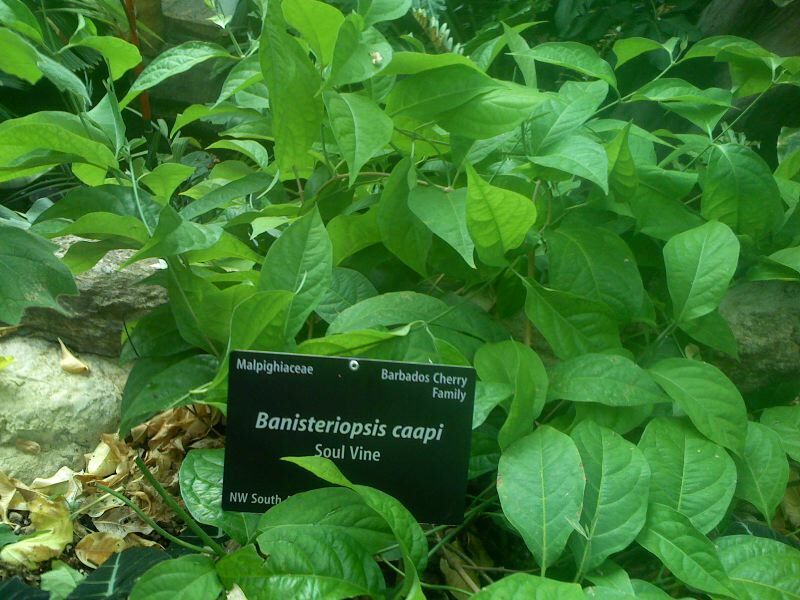 Banisteriopsis caapi grows indigenously in the western parts of the Amazon Basin, primarily Brazil, Colombia, and Peru. This plant is also cultivated in tropical environments. Psychotria viridis is a perennial bush that grows to 5 m in height and has a unique combination of plant structures (foveolae, stipules). The elliptical, smooth leaves are opposite (i.e., produced in pairs along the stems), growing to about 5-15 cm long and 2 – 6 cm wide. There are 5 – 10 pairs of secondary veins and occasionally microscopic plant hairs appear on the lower surface. The leaves arise on leaf stalks (petioles) that are about 1– 10 mm long. The leaves are usually gray or red- brown when dried. Foveolae are small pockets found on the lower leaf surface near the junction of the side (secondary) and central veins. These distinctive microscopic structures have an opening near a secondary vein that provides shelter for symbiotic mites capable of destroying destructive fungi and herbivorous invertebrates. Each leaf bears at least one pair of foveolae that usually occur near the apex; vegetative stems typically contain more foveolae than reproductive stems. Psychotria viridis grows in wet lowland tropical forests in Cuba and northern Central America as well as western and central South America, particularly in the Amazonian Basin near Peru and Bolivia. The ceremonial drink ayahuasca contains the reversible monoamine oxidase A inhibitors (MAOI) known as harmala alkaloids and the classic hallucinogen, N, N-dimethyltryptamine (DMT). Collectively, harmala alkaloids are β-carboline compounds (i.e., harmine, harmaline, tetrahydroharmine). β -carboline compounds are heterocyclic, dehydrogenated derivatives of tryptophan that occur endogenously in mammals and some plants as a result of the Pictet – Spengler condensation of indolealkylamine compounds with aldehydes. The tryptophan – derived β – carboline compounds have some structural similarity to N-methyl-4 -phenyl – 1,2,3,6 tetrahydropyridine (MPTP), which causes irreversible parkinsonism as a result of metabolism to a neurotoxic quaternary ion, 1-methyl-4-phenyl pyridine(MPP). Tryptamine compounds are tryptophan – derived compounds with a basic indole ring, similar to serotonin; DMT is the prototypical member of the ring- unmodiﬁed tryptamine compounds. DMT is structurally related to serotonin and similar to other psychedelic agents (e.g., lysergic acid diethylamide [LSD], mescaline). DMT is a serotonergic agonist and classic hallucinogen that produces vivid visual imagery and poorly formed auditory hallucinations following inhalation or intravenous administration to experienced hallucinogen users. Harmine and harmaline are reversible, competitive, type A monoamine oxidase (MAO-A) inhibitors, whereas tetrahydroharmine is a weak inhibitor of serotonin uptake at presynaptic sites. Harmaline and harmine have pKa values of 9.55 and 7.45, respectively. Ayahuasca contains harmala alkaloids together with DMT; this combination has mild sedative and hallucinogenic properties similar to the classic hallucinogen, 1 – (2,5 – dimethoxy – 4 – methylphenyl) 2 – aminopropane (DOM). Anecdotal reports suggest that the effectiveness of ayahuasca preparations rapidly degrade after 3 days of storage. Harmaline users have noted vision distortions when looking at real objects, accompanied by loss of sensitivity in other physical senses. Unwanted effects may include dizziness, pressure in chest, nausea, vomiting, and weariness. Feelings of anxiety may arise. One investigator gave harmaline to urban residents and was intrigued that they hallucinated jungle animal imagery; according to some reports, dosage must be almost poisonous for such effects; otherwise, actions are more sedative than psychedelic. Some authorities declare that harmaline aids psychotherapy; others dispute that assertion. Harmine has been tested as a treatment for Parkinson’s disease, with mixed results. Harmine can slow heartbeat, lower blood pressure, produce tingling and dizziness, and make hands and feet cold. Hallucinations and a feeling of ﬂoating have been reported. The harmine, harmaline, and tetrahydroharmine in yage are all monoamine oxidase inhibitors (MAOIs). Yage might cause overdose effects if a person is taking other MAOI drugs (found in some antidepressants and other medicine), and ayahuasca could cause problems if a person is also using drugs that interact badly with an MAOI. Shamans in the Amazon Basin use this inebriating tea in traditional medical diagnosis and healing, divination, pathway for access to the supernatural, and rites of passage, particularly in the Brazilian- based syncretic religious groups (Santo Daime, O Centro Espirita Beneﬁciente Uni ã o do Vegetal). The latter church uses sacramental brews of ayahuasca as part of a religious ritual (preparo), whereas the Santo Daime church uses a decoction (santo daime) of P. viridis and B. caapi in the ritual called feitio. During religious ceremonies, participants typically drink the tea every hour; vomiting frequently accompanies the use of the tea. Piaroa shamans from southern Venezuela use the cambium from B. caapi alone (i.e., without DMT- containing decoctions) to heighten empathy among tribal members. The Piaroa people also use B. caapi as a hunger suppressant, stimulant, and hunting aid to enhance visual acuity. Limited data on ayahuasca users does not suggest that the ritualistic use of ayahuasca is associated with serious deterioration in the psychosocial interactions typically caused by other drugs of abuse. Because of the poor oral bioavailability of DMT, DMT is usually smoked after adding the solid brownish material to a marijuana cigarette. Typically, the use of smokable DMT is associated with a pattern of extensive drug use. The rapid intensity and resolution (i.e., about 30 minutes) of the effects associated with smoking DMT results in the eponym, businessman’ s lunch trip. Ayahuasca tea is an herbal drink which is a mixture of plants found naturally in the Amazon jungle, which has been in use for centuries as part of religious and healing ceremonies. Some components of ayahuasca tea feel that it has medical benefits, and it causes hallucinations. Western medicine has been paying attention to ayahuasca for the potential of the tea to help people who suffer from disorders like depression and anxiety. A tea is made from the leaves of a flowering vine, Baisteriopsis caapi. The tea may also be mixed with the leaves of a shrub Psychotria Viridis or depending on the culture the tea is being made in, other shrubs may also be combined. Usually, Ayahuasca tea is combined with a plant species that contains DMT, which in the example above is the Psychotria viridis. Without this, the tea doesn’t have the psychoactive effects. Some other ingredients that may be added to ayahuasca tea include ayahuma bark, capirona bark, uchu sanago and wyra Caspi bark. When someone consumes ayahuasca tea, they often say they have spiritual revelations and deep insight that helps heal their emotional wounds and allows them to become a better person. Small doses of ayahuasca produce euphoria; larger ones produce hallucinations (blue is reportedly a predominant color in the visual images). Sexual imagery has been noted, but debate exists on whether ayahuasca preparations are aphrodisiacal. An account from recreational users says yage itself has barely any hallucinogenic actions but describes yage as enhancing such effects from DMT. Sedative properties appear as the drug experience proceeds. Unwanted yage effects include nausea, vomiting, and ringing or other noise in the ears. Users of ayahuasca drinks report an urgent need to defecate; other reactions may include tremors, perspiration, and tingling in hands or feet. Typical doses of DMT for smoking are 40– 50 mg with a range of about 20 – 100 mg. The administration of 0.1 mg/kg intravenously causes an undesirable feeling of physical tension without the euphoria present following the higher dose. In a double-blind, saline placebo-controlled, randomized study of 10 experienced hallucinogen users given DMT intravenously, the threshold for signiﬁcant physical effects (e.g., increased blood pressure and heart rate, pupillary dilation, increase rectal temperature) was about 0.2 mg/kg body weight. A more intense disorganizing effect, rush, and perceptual perturbations occurred after the administration of 0.4 mg/kg; some users considered these effects unpleasant. Altered perception including the appearance of rapidly moving, brightly colored visual images also occurs in volunteers administered the same intravenous doses. The administration of 0.3 mg/kg followed in 1 minute by a continuous infusion of 0.02 mg/kg/min for 84 minutes produced a strong alteration of visual and auditory phenomena along with paranoia and body misperceptions (e.g., body melting away, difﬁculty sensing the boundaries of their bodies). The typical infusion of P. harmala for sedative effects involves the steeping of 5 – 10 g crushed seeds. The ingestion of 50 g P. harmala seeds was associated with nausea, vomiting, and hallucination. One of the ways an ayahuasca trip is different from an LSD drug experience is the fact that most abusers say they know they’re hallucinating, and instead of imagining voices, they usually just hear exaggerated sounds that are actually occurring around them. There seems to be a consensus that for many abusers who take ayahuasca are more self-aware of what’s really going on, and less of a loss of reality, however for every individual the experience can be different and there is for sure no way to predict how you will feel or react to the use of ayahuasca. The ayahuasca drug is usually used by those as a way to deal with past painful or traumatic experiences or to cope with certain thoughts or emotions. Despite the differences reported when using the ayahuasca drug compared to other hallucinogens, the effects on the brain seem to be somewhat similar. All of these drugs impact neural activity, and there a reduction in restraint of brain function, which is many believe that these substances let people experience their emotions differently, feel a higher level of consciousness and be more introspective. Brain scans of those who used ayahuasca have shown that the neural activity in the visual cortex increases as does activity in the limbic system. The limbic system is responsible for how you process your memories and emotions. It can also create a meditative state in the brain, which can quiet overactive actions of your brain that lead to depression and anxiety. The DMT element of ayahuasca interacts with your serotonin receptors, which has an impact on things like emotion and vision. It’s not out of the question that hallucinogens or psychedelic drugs like ayahuasca have the potential to treat situations like anxiety, depression or PTSD, but at the same time, people should understand that these substances do also have side effects. Absorption. There is substantial interindividual variability in the bioavailability of harmala alkaloids. Based on clinical effects, the absorption of N, N – dimethyltryptamine (DMT) following inhalation is rapid. Smoking DMT produces rapid onset of effects within 5 minutes, and these effects resolve within approximately 30 minutes. The bioavailability of DMT after ingestion is too low to produce clinical effects, probably as a result of the enzymatic degradation in the gastrointestinal tract to an inactive metabolite. Detectable DMT concentrations following the ingestion of ayahuasca probably result from the inhibition of monoamine oxidases in the gastrointestinal tract and/or liver by the β-carboline metabolites (i.e., harmol or harmalol). These inhibitory effects limit the enzymatic degradation of the simultaneously ingested DMT in ayahuasca, resulting in enhanced absorption of DMT and allow subsequent psychedelic effects. Studies indicate that the intense visual imagery associated with the ingestion of ayahuasca correlates to peak plasma concentrations of DMT occurring about 1.5– 2 hours after ingestion. Similarly, the mean peak plasma DMT concentrations was about 1.5 hours after ingestion of freeze-dried ayahuasca (0.6 and 0.85 mg DMT/kg body weight) by 18 volunteers. Elimination. The O-demethylation of harmine and harmaline to harmol and harmalol, respectively, involves a variety of cytochrome P450 isoenzymes including CYP1A1, CYP1A2, CYP2C9, CYP2C19, and CYP2D6. Kinetic studies indicate that the primary CYP subfamilies involved with the O-demethylation of these β-carboline compounds are CYP1A1 and CYP2D6. The glucuronide and sulfate of harmol and harmalol are the main urinary metabolites of harmine and harmaline biotransformation. 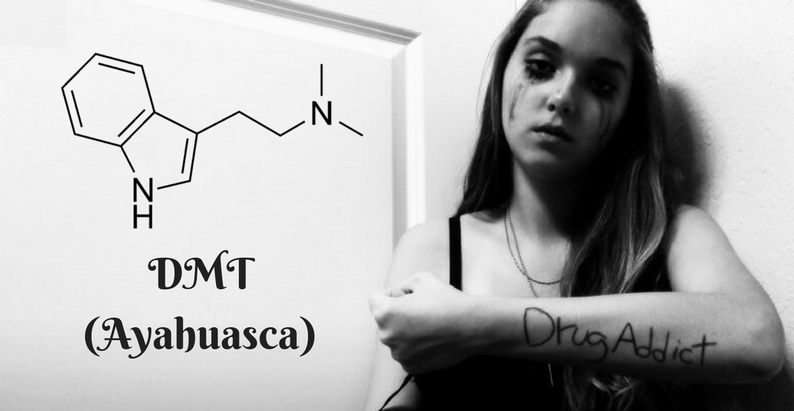 The metabolism of DMT following ingestion of ayahuasca involves N – oxidation (dimethyltryptamine -N-oxide) and oxidative deamination. Little unchanged DMT appears in the urine. How long Ayahuasca (DMT) stays in the system? If you were to take DMT without a combination with some MAOI, you would end up rapidly metabolizing it through MAOA enzymes. Erowid reports that the average elimination half-life of DMT is approximately 15 minutes in humans. This indicates that 50% of an exogenously ingested DMT dose will have been cleared from the plasma in around 15 minutes. Complete plasma clearance of DMT will, therefore, take around 1 hour 23 minutes. Assuming that the 15-minute half-life applies, it can be expected to excrete the drug fully (in the form of metabolites) within 2 hours of your dose. Other factors such as the specific DMT you took (source, dosage, etc.) and route of administration may affect plasma clearance. In other words, the drug will linger in your body for about an hour after your psychedelic experience ends. Does Ayahuasca (DMT) show up on drug tests? The body metabolizes DMT very quickly, although different drug tests will show the presence of the drug after different amounts of time have passed. Urine tests can detect the presence of DMT for 24 hours; after that, the drug passes through the kidneys and completely out of the body. Saliva tests will show the presence of DMT for approximately 1 day and 5 days after the drug has been consumed. There is no data on whether smoking, snorting, or eating DMT shows up for longer in the saliva. Hair tests can show the presence of any drug for 90 days, including DMT. If a person uses DMT once and is not a habitual user, this one-time experience will show up in their hair for three months. There is no data on whether DMT shows up in blood tests, although it metabolizes out of the body so quickly that this test is unlikely to be more effective than a urine test. People abuse Ayahuasca to create a psychedelic experience, like other hallucinogens. In various traditional cultures, ayahuasca is often used by shamans o open up communication with nature to determine what’s causing someone to be sick at the spiritual level. In some religious ceremonies such as those in Brazil, ayahuasca has to be taken by everyone who participates in the ceremony, and they sing and chant as they drift into a trance. In contemporary Western society, there is an interest in ayahuasca by people who are intrigued by the use of mind-altering substances to overcome anxiety and fears and explore the capabilities of their mind. People also often become interest in ayahuasca after hearing anecdotal stories of people who have used it to heal a variety of problems including addiction and depression. Of course, this isn’t the only psychedelic that’s been used for that purpose. DMT that is the most active ingredient in the ayahuasca and by itself is not currently known to have a potential for physical addiction nor dependence. However, a psychological craving may appear similarly with the use of other hallucinogens as well. Whereas the chemical properties of DMT might not lead to addiction, abusers often become psychologically addicted to the experience of using a drug like DMT or drinking ayahuasca tea. They may wish to continue recreating the experiences and feelings they had after the use of this substance, which can lead them to use it continuously. Additionally, some of them may want to escape their reality or have a connection with other people that can come from the circumstances surrounding ayahuasca. The development of serotonin syndrome during intoxication by tryptamine compounds may occasionally cause leukocytosis, rhabdomyolysis (i.e., in association with muscle rigidity), or hepatorenal dysfunction (i.e., in association with hyperthermia). The effect of ayahuasca on an electroencephalogram (EEG) primarily involves a decrease in the absolute power in the classical frequency bands, particularly in the delta and theta bands. Power analysis of EEGs from 18 volunteers receiving 0.85 mg DMT/kg body weight demonstrated reductions in the power densities of the alpha-2, beta-1, delta, and theta frequency bands over the temporal-parietal-occipital junction as well as decreases in theta power over the medial temporal and medial frontal regions of the cortex. These areas comprise the regions of the brain associated with emotion, memory processes, and integration of sensory information. The EEG findings more closely resemble the stimulant effects associated with LSD use rather than general stimulants (e.g., amphetamine, methylphenidate). Life-threatening medical reactions following exposure to tryptamine compounds are extremely rare. All patients should be evaluated for associated diseases with vital signs, physical examination, and a complete history that includes current symptoms, prior medical problems, and previous psychiatric history. Vital signs should include an accurate core temperature that is repeated if the patient deteriorates. The sympathomimetic effects of tryptamines are usually mild and transient, except in patients with the underlying cardiovascular disease. Laboratory investigations in patients with severe intoxication or signs of the organic disease include complete blood count, electrolytes, hepatic aminotransferases, serum creatinine and creatine kinase, urinalysis, and urine for drugs of abuse screening as well as computed tomography (CT) of the brain if neurologic disease is suspected. The usual methods of decontamination are almost always unnecessary because of the rapid absorption of tryptamine compounds; the use of decontamination measures complicates the treatment of agitated patients. In addition to the use of benzodiazepines, reduction of sensory stimulation, and reassurance that the frightening images are not real are important aspects of the management of tryptamine- related panic attacks. The patient should be placed in a safe, quiet environment, preferably with a familiar person who can provide constant reassurance (i.e., “ takedown ” ). 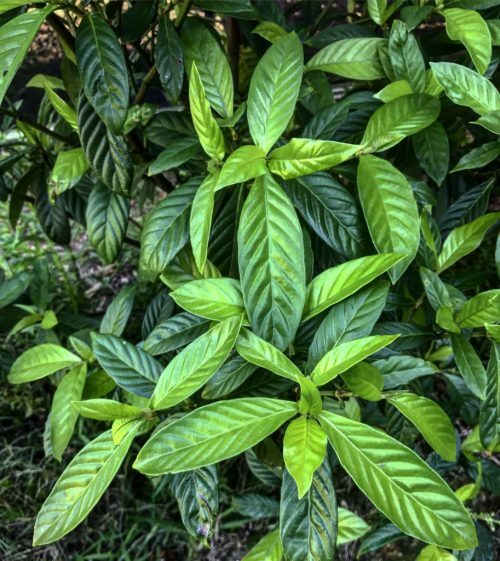 Can Ayahuasca be used as an effective addiction treatment? Anecdotal and observational research, which can at best be described as preliminary, has suggested ayahuasca-assisted therapy could have positive effects in the treatment of substance abuse disorders. However, claims that ayahuasca can be used to cure drug addiction should be taken cautiously. In two Brazilian churches small studies have documented improvements among members who were substance dependent. The addicted individuals who participated in the studies self-reported that taking part in the churches’ rituals had a direct effect on their recovery. However, these studies include only subjects who are committed members of their respective religious communities, so it remains unclear whether being a part of a spiritual community or taking ayahuasca itself contributed to fewer reported substance abuse problems. Another preliminary study found that participants in a four-day ayahuasca-assisted therapeutic retreat sustained improvements in the severity of substance abuse problems and showed an increase in quality of life at a six month follow up. Again, there was no control group in this study which makes it impossible to determine whether the psychoactive tea itself or simply being a part of a spiritual retreat contributed to the noted improvements. Documentation of complete abstinence and full long-term addiction recovery after using the drug is rare and limited to single-person testimonials.The lack of solid scientific evidence has not stopped people from claiming therapeutic benefits and attempting to use ayahuasca rituals as addiction treatment. However, there are significant physiological and psychological risks involved in taking this route. In 1971 DMT became illegal in the U.S. under the Convention on Psychotropic Substances. DMT is classified in the U.S. as a Schedule I drug. This would mean in technical standards DMT is illegal. Therefore ayahuasca is indirectly illegal. The ayahuasca brews using DMT are illegal in the U.S., but there is work by certain religious organizations to challenge this. They’re using arguments similar to what happened with the Native American Church and the use of peyote. Despite varying and often vague legal status of ayahuasca tea in the U.S. and around the world, many people have turned to vacations as a way to try the substance. Writers from outlets like National Geographic have written about their trips to South America and The New York Times covered it in 2010. There have also been shamans who have come to the U.S. to bring the experience of ayahuasca to people who want it. People who visit ayahuasca retreats in the Amazon rainforest often go for the healing of both mental and physical illnesses, and there is a bit of information showing it may improve health. So, in the U.S. the tea itself isn’t necessarily illegal, but the necessary DMT component is, as DMT is a Schedule I drug. The only exceptions are for certain religions when they’re using ayahuasca tea as part of a legitimate religious event.